from Caporaso JG, Lauber CL, Walters WA, Berg-Lyons D, Huntley J, Fierer N, Owens SM, Betley J, Fraser L, Bauer M, Gormley N, Gilbert JA, Smith G, Knight R.
These observations, in agreement with studies that have addressed this question directly (Kuczynski et al., 2010), suggest that increasing the sequencing depth is not likely to provide additional insight into questions of beta diversity, and we therefore argue that (for questions of beta diversity in particular) the decreased cost of sequencing should be applied to study microbial systems using many more samples, for example, in dense temporal or spatial analyses, rather than with many more sequences per sample. Of course, if the objective is to identify taxa that are very rare in communities, deeper sequencing will be advantageous. Additionally we note that while as few as 10 sequences per sample may be useful for differentiating very different environment types (for example, soil and feces), as environments become more similar (for example, two soil samples of different pH) more sequences will be required to differentiate them. Imagine a fabric that grows...a garment that forms itself without a single stitch! Micro'be' fermented fashion investigates the practical and cultural biosynthesis of clothing - to explore the possible forms and cultural implications of futuristic dress-making and textile technologies. Instead of lifeless weaving machines producing the textile, living microbes will ferment a garment. A fermented garment will not only rupture the meaning of traditional interactions with body and clothing; but also raise questions around the contentious nature of the living materials themselves. This project redefines the production of woven materials. By combining art and science knowledge and with a little inventiveness, the ultimate goal will be to produce a bacterial fermented seamless garment that forms without a single stitch. So - in essence they are trying to grow clothing as a side product of wine fermentation. Not sure what it is like to wear such clothing - or to be around someone wearing it - but it is a fun idea. Aaarrrg. Well, I was snooping around google news, search for "archaea" and this came up: foodconsumer.org - How Your Gut Flora Influences Your Health. "The microbes in the human gut belong to three broad domains, defined by their molecular phylogeny: Eukarya, Bacteria, and Achaea." Wow - this surprised me. An article at some place called Food Consumer that was mentioning archaea. But that was pretty much the only decent part. Things went downhill fast with a link to some total BS on a way to cure every disorder on the planet by focusing on gut microbial health. "The ideal balance of beneficial to pathogenic bacteria in your gut is about 85 percent good bacteria and 15 percent bad. Maintaining this ideal ratio is what it's all about when we're talking about optimizing your gut health. " Yes that is right everyone - you want to maintain a ratio where 15% of the bacteria in your gut are pathogenic. Aaarrggh. Not surprisingly, when I searched around the web for detail on the person behind this article - some Dr. Mercola - who I have never heard of - I discovered that he is considered by many to be a quack. No disagreement from me. Just got back from the Canadian Society for Microbiology meeting where I gave the keynote talk on the last day of the meeting (Saturday). Was a very short, but good trip. Got to see some key collaborators and colleagues and Vancouver was very nice for the few days I was there. I recorded my talk on my laptop using the Keynote "Record Slideshow" function. I then exported it to Slideshare (just the slides - no audio) and to Youtube (video of slides with audio). They are posted below. I also did a mini storification of my talk which is also below. Definitely worth a serious browsing/reading. I don't normally post about ads but this one is quite well done. From Thermo Scientific - "More than a freezer". Well, I could say so so much about this. But it speaks for itself. Funny. Gross. Cute. And more. Just watched it - like - seven times in a row. Best. Microbiology. Video. Ever. For those not familiar with Twitter - this abbreviation w/ the # is known as a hashtag - and if everyone at a meeting uses this hashtag in their posts about the meeting then it is easy to keep track of all the meeting posts by searching for posts with that hashtag. Such searches can be done in real time with various Twitter clients or via the Twitter website. Ooh - cool - got to get this "Illustrated Children’s Book Introduces Invisible World Of #Microbes"
Just saw this news story: Illustrated Children’s Book Introduces Invisible World Of Microbes. This looks like a potentially good addition to the list of books that could be called "Microbiology for Kids." 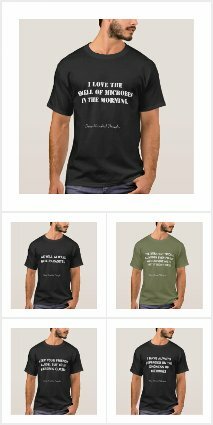 I have made a collection at Amazon of examples in this area. Any other suggestions for microbiology books for kids? 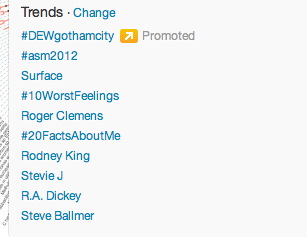 The session at the ASM 2012 meeting on “The Great Indoors” seems to have gone well. I will be writing up a more detailed report but here is a quick summary done via “Storify”. At the GSC13 meeting a few months ago there was a session on microbiology of the built environment which was sponsored by my microBEnet project. Posting some details from the meeting here. Meeting report for the whole meeting in SIGS. Making a list of blogs that focus entirely or partly on microbiology topics. Here are some. Would love suggestions for others. Obviously not all are of equal quality in terms of the writing or the science but the diversity is impressive. Coming up at the #ASM2012 mtg. "The Great Indoors: Recent Advances in the Ecology of Built Environments"
The American Society for Microbiology meeting is starting tomorrow and there are multiple things related to microbiology of the built environment there. These include a session that was organized by Brendan Bohannan which I am chairing. Description: Although humans in industrialized countries spend nearly 90% of their time in enclosed buildings, we know very little about the biology of the indoor environment. However, this is starting to change. Over the past few years, the field of indoor ecology has grown dramatically. Ecologists are beginning to apply ecological theory and concepts to understanding buildings as ecosystems. A new understanding of the biodiversity of built environments is emerging, as well as a new appreciation of the importance of interactions between humans and non-human life indoors. The proposed symposium will showcase this emerging understanding. We will feature presentations that demonstrate the utility of ecological theory for understanding built environments, that describe the dynamics of biodiversity indoors and that illustrate the interactions of humans with indoor ecology. Our focus will be on the ecology of the dominant forms of non-human life indoors - microorganisms - and their interactions with humans. Just collecting here the new papers from the Human Microbiome Project and some news stories discussing them. Microbiology: Learning about who we are - commentary by Relman (Caution - hidden behind a paywall) but PDF available here. At IOM Forum on Microbial Threats "Science And Applications of Microbial Genomics" meeting in DC. To find out current details on the meeting check out Twitter hashtag #SAMG12. See feed below (though it is easier to go to Twitter to follow #SAMG12). A few days ago I wrote a post: Report on "Egregious Academic Freedom Violation" at #UCDavis. The post provides some detail on an investigation carried out by the UC Davis Academic Senate into a case of apparent retribution at the UC Davis medical school. In the case the Dean of the Medical School (Claire Pomeroy), the Executive Associate Dean Fred Meyers and the Health System Counsel appear to have carried out a retribution of sorts against a member of the faculty at the medical school (NOTE - I have a half appointment at the medical school). The faculty member - Michael Wilkes had the gall to write an editorial (with Jerome Hoffman) for the SF Chronicle expressing opinions about a medical issue and actions of some people at the UC Davis Medical School. Apparently, some people at the medical school did not like being criticized. The result? A threat to take away his space, to remove him as instructor of a medical school course, and other incites including a threatening email/letter from the medical school counsel. Lovely. Fortunately, the UC Davis Academic Senate was brought into the case by Wilkes and a committee of the academic senate responded VERY strongly with a report (see my previous post with more detail). Meanwhile - news of the report spread and was covered in Inside Higher Ed. It was then that I heard about it and felt the need to blog about it. And news has spread a bit more (thank you PZ Myers and others). On Friday, the UC Davis Academic Senate met (and though I am not a member of the Senate, I went to the meeting). And the Senate passed three resolutions coming out strongly in support of Prof. Wilkes and critiquing the behavior of the Dean, Asst. Dean and Counsel from the Med. School. Just after the resolution was passed the faculty received an email from the Provost Ralph Hexter that was very strongly saying he supported academic freedom on campus. Here are some related links and updates that I collected as the story has unfolded. How many microbes come into the human GI tract from outside sources (e.g., food)? How many kinds come in? How much flow through is there vs. digestion vs. colonization? Note - I know there have been many studies of pathogens on food and how they get into the GI tract, but what about non pathogens? Any references or #s would be very helpful. Just got this email in regard to the recent Academic Freedom Issue at UC Davis. "A university must…be hospitable to an infinite variety of skills and viewpoints, relying upon open competition among them as the surest safeguard of truth. Its whole spirit requires investigation, criticism, and presentation of ideas in an atmosphere of freedom and mutual confidence. This is the real meaning of 'academic' freedom." A committee of our campus's Academic Senate has devoted considerable time and effort to examining an assertion by a faculty member of the UC Davis School of Medicine that his academic freedoms were compromised by school administrators. Our Senate's Representative Assembly earlier today heard and ratified the committee's findings. Academic freedom is sacrosanct at UC Davis, and the underlying assertions in this matter are deeply troubling. My office will review this case and take appropriate actions. Crossposting this here --- posted originally on my lab blog. NOTE - many updates down below at the bottom of page. On Friday, the Academic Senate Committee on Academic Freedom and Responsibility (CAFR) will be presenting their report, “Egregious Academic Freedom Violation” which begins on page 62 of the June 8 Representative Assembly meeting call (http://academicsenate.ucdavis.edu/ra/RA-Meeting-Call-2012-06-08.pdf). The Committee on Elections, Rules and Jurisdiction (CERJ) has put the recommendations of the CAFR report into the form of resolutions, which are attached. In order to be voted on by the Representative Assembly, the resolutions would have to be moved and seconded. We hope that the attachment will assist the Representative Assembly as its members review and consider CAFR’s recommendations. 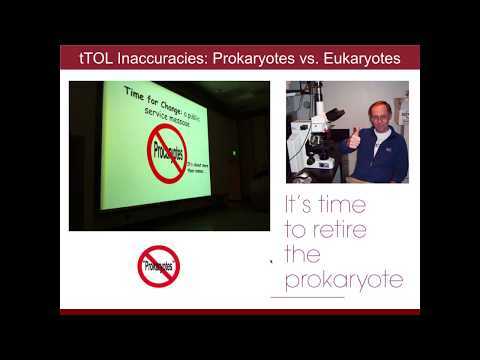 Does phylogeny matter? (In Eco-Evo meta-analyses) ... Apparently, yes, but it depends. As many may know - I am pretty obsessed with the uses of phylogeny in biological studies. In fact, one could say this has driven almost all of my work. 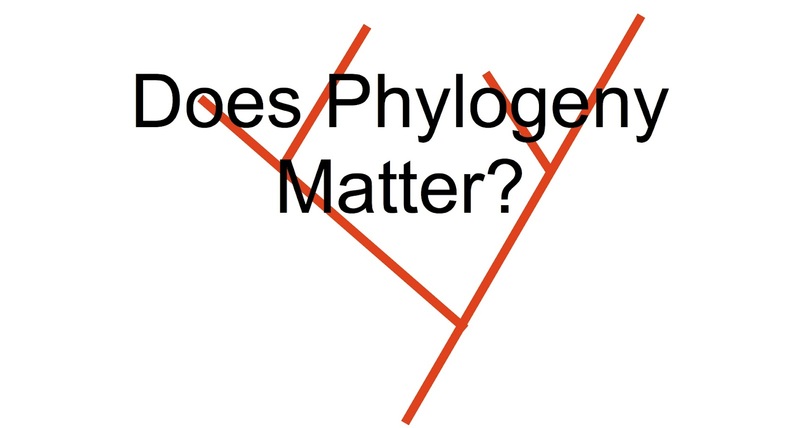 Thus when an email went around a little bit ago about an article for a journal club at UC Davis where the title begins with "Does phylogeny matter? ", well, I had to take a look. Alas, I was a bit worried when I saw the article was in Ecology Letters because I am at home and was not sure about access policies for this journal. But I was pleasantly surprised to get full access without any library - VPN login to the following article: Does phylogeny matter? Assessing the impact of phylogenetic information in ecological meta-analysis - Chamberlain - 2012 - Ecology Letters - Wiley Online Library. I cannot figure out WHY it is freely available right now, nor how long it will be, but I took the chance to look the article over. OK. I love that people ask me lots of questions about evolution, genomics, microbes, a mix of the two, etc. But I just cannot keep answering single one-off emails about these topics. So I am starting online office hours. If you have any general questions about phylogenetics, evolution, genomics, microbes, or any of the work done in my lab, please post your questions here. And I will try to answer them. All of this without any link to a paper, without any data, without any real details. Shameful. Not saying genomic medicine does not have a lot of promise. But this "essay" is so excessively focused on PR for one company that there is no reason to have any faith in anything said in it. 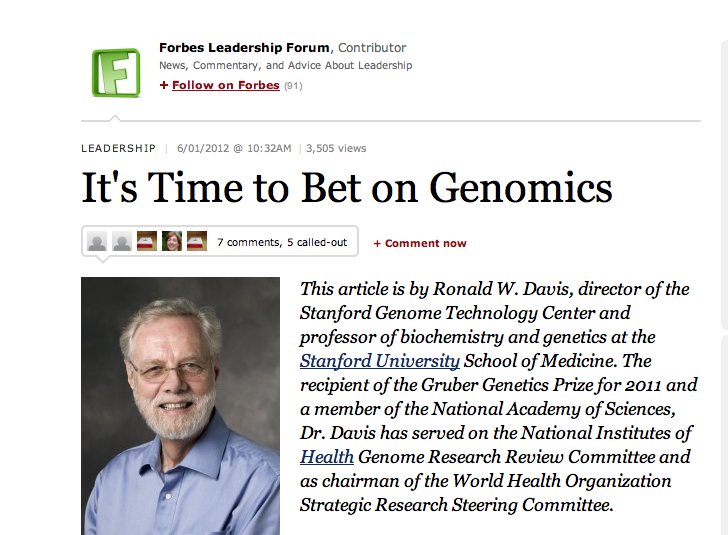 I am therefore giving Ron Davis and Forbes my coveted Overselling Genomics Award (#7). Plus I think Forbes deserves some sort of award for "Publishing PR" but I will have to think one of those up. This piece almost certainly never should have been published at Forbes.Com without many many more caveats. Yuck. UPDATE - here is a screenshot from the Forbes Web site. 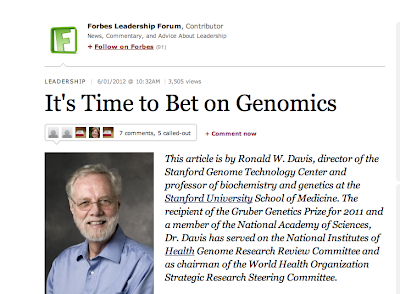 It is marked as "Forbes Leadership Forum" ... hard to tell whether it is meant as an essay, editorial, op-ed, or what. Just got back from a Sloan Foundation funded meeting in Boulder, Colorado that focused on microbiology of the built environment. More on that another time. What I want to tell you about - no - what I need to tell you about - is the entertainment that the meeting organizers arranged at dinner Thursday night. We had dinner at Red Lion Restaurant - a phenomenally gorgeous spot in the canyon just West of Boulder. And while we were milling around before dinner I saw out of the corner of my eye a woman walking in to the tent where we were to have dinner. She was dressed in almost all white and was carrying a giant silver spoon. So I asked the meeting organizer - Mark Hernandez - if she was the entertainment. And surprisingly he said - yes - she was a dancer and Professor at Boulder and also did a kind of science performance art.